The concept of a capability maturity framework (CMF) emerged from the Strategic Highway Research Program 2 (SHRP2) L01 and L06 projects that promoted a process-driven approach to improve Transportation Systems Management and Operations (TSM&O). Process matters: Projects fail or do not achieve desired functionality for a variety of reasons not related to the technology. Prioritizing the right action is important: Is an agency ready, how do they know, and what should they do next? Focus on the weakest link: What is holding the agency back in becoming a leader in a particular area? Building on SHRP2 results, the American Association of State Highway and Transportation Officials (AASHTO) continued development of this concept and a capability maturity concept was published as part of the TSM&O guidance. SHRP2 implementation activities have successfully used the overall framework to work with State DOTs to develop action plans to improve their TSM&O capabilities. These frameworks are designed for agencies and regions to assess the current strengths and weakness and develop a targeted action plan for the program area. More details can be found of the FHWA Operations web site: http://www.ops.fhwa.dot.gov/tsmoframeworktool/index.htm. In all these instances, the use of the framework will provide a structured approach to review the complex institutional architectures and business processes required to make RWM a success. By reviewing the "non-technical" issues in detail and implementing the prioritized actions, agencies will increase the capability and sophistication of their RWM program. A Road Weather Management CMF and a supporting interactive tool have been developed. The current version of the framework is available at http://www.ops.fhwa.dot.gov/tsmoframeworktool/available_frameworks/road_weather.htm. A collaborative process is recommended for using the CMFs for any program area. Typically, a local agency champion will pull together stakeholders for a day-long workshop to walk through the framework. RWM stakeholders may include maintenance staff, operations staff, meteorologists, and emergency operations managers. The outcomes of the workshop are a consensus of the current capabilities across all the dimensions and an initial list of prioritized actions. The champion might then convene future meetings or identify existing forums where the identified actions will be championed and implemented. The framework is not intended as a benchmarking tool, but rather as a resource for agencies to identify appropriate actions for improving management and operations of road weather management. 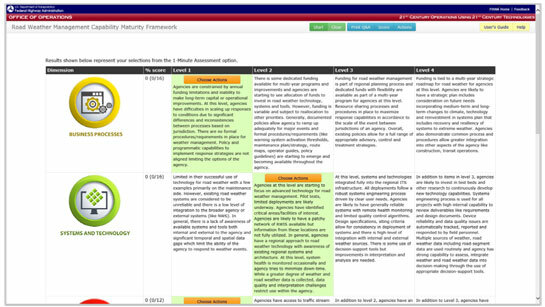 While periodic assessments are not required, revisiting the tool is recommended when significant organizational change occurs or prior to major investments in the area. If interested in using the framework, or hosting a CMF workshop for your agency or region, please contact: Operations Feedback at OperationsFeedback@dot.gov.